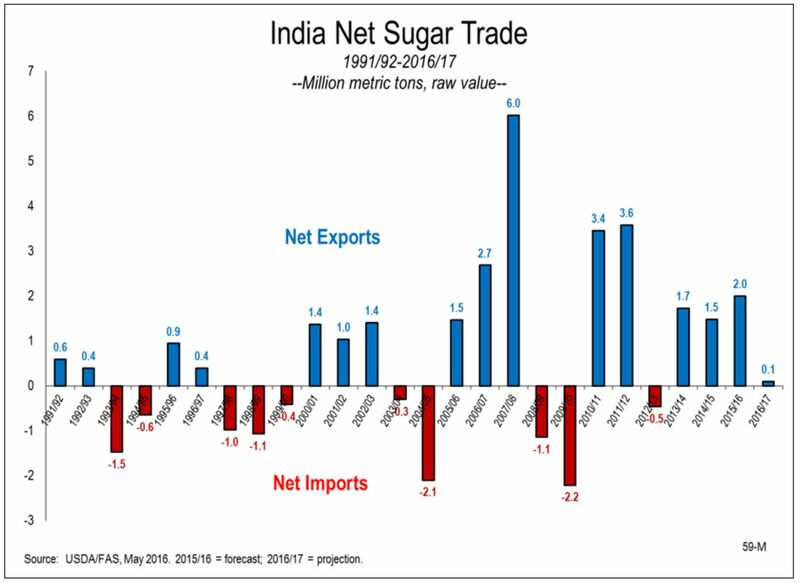 Perhaps CATO will focus a bit of its sugar policy ire on India during this session, considering India’s past government-control tendencies appear to be alive and well when it comes to the sweet stuff. How heavy handed is the Indian government in the sugar market? Look no further than its exports and imports of the crop. Over the last 25 years, India has been a net importer of sugar for 10 years, whereas it’s been an exporter of sugar for 15 years. Is this fluctuation the result of natural market forces? Hardly. India’s yo-yo sugar story is a direct reflection of supply control by the government to prop up businesses and appease constituents. India’s government sets the price millers must pay growers for their sugarcane, generally at generous levels, then subsidizes the millers so that they can make the grower payments well above market levels. Since the growers are responding to high-government prices, rather than the market, they continue producing, and overproducing, even when market prices have fallen. Furthermore, India subsidizes sugar sales to the poor, and pays producers to export or store sugar when surpluses mount. The last three years provides an excellent case study in the schizophrenic nature of these kinds of market-distorting schemes. India introduced a special subsidy in early 2014 to spur sugar exports to shrink domestic surpluses. This WTO-illegal subsidy was subsequently increased several times, coupled with state-level export subsidies, and eventually tied to government export mandates. Surprise, surprise. India quickly became one of the world’s biggest exporters. And since it is tough competing in the volatile export market with the likes of Brazil and Thailand – two of the most subsidized producers in the world – India continued to ladle on more goodies in the form of debt forgiveness, import tariffs, and direct government checks, as it’s been doing for many years. But now, India fears that too much sugar is leaving, which may starve the domestic market. So this year, India is abandoning the export subsidies and is instead levying a 25 percent tax on exports. Surprise, surprise. India is no longer a sugar exporter. This is the upside-down world in which efficient U.S. sugar producers must compete, and it is just one of the many examples of foreign cheating that necessitates a no-cost U.S. sugar policy. It sure would be nice if critics like CATO would take a break from bashing U.S. farmers and praising India as a “potential superpower” long enough to recognize what’s really happening in the world of sugar.